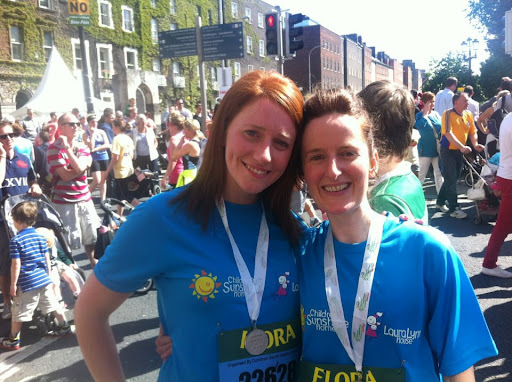 Two months ago, I took a mad notion and decided I’d run 10km for charity. Okay, I lie. I did no such thing. I decided I’d repeat the efforts of previous years, and sign up for the Women’s Mini-Marathon, do some token training – consisting of running 500m down the road and back while feeling faintly ridiculous – for the week preceding the big event. Then I’d turn up on the day, togged out like a pro. I’d jog a little and feel smugly fit and healthy before starting to wheeze, and would happily succumb to a(n albeit brisk) walking pace around the 2k mark. Then I’d finish triumphantly by jogging across the line at a respectable 1 hour 40 minutes and head to the pub to smugly celebrate my achievement. I work for a large multinational corporation. I’ll openly admit that this is not necessarily the career path I’d have chosen as a young idealist, but it’s worked out well for me. While I work hard, and sometimes excessively long hours, I consider myself pretty lucky that I can work with some great clients who do fantastic work in the social arena. I’m glad that as part of my day job that I get to meet people who inspire me, and I’m grateful that I’m able to play a very small part in helping them achieve their aims more effectively and successfully. One of the single biggest positives of my job is that as part of our corporate social responsibility programme, I with a small team of others have been able to work closely with the wonderful people at LauraLynn House, Ireland’s first – and only – Hospice for terminally ill children. Social responsibility programmes within big multinationals sometimes get a bad rap among cynics, who suggest they smell a little of tokenism and are simply part of an effort to generate positive PR, but I say, if I can contribute to a cause like LauraLynn House, even to a tiny extent, as part of my day job, then that’s good enough for me. I’m sure by now that most of you have heard Jane and Brendan McKenna’s tragic story, but if not, you can read it here where you can also find out a little more about the work that the Children’s Sunshine Home and LauraLynn House do. Three weeks ago, I was confronted with an image on the front of the Irish Independent that stopped me in my tracks. 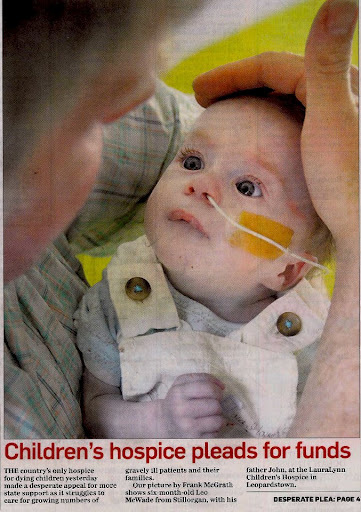 Tiny baby Leo McWade, aged 6 months old, gazing up at his dad with his beautiful big eyes, had been born with an inoperable heart defect. Told he would have very little time, his parents, Catherine and John had brought him home to care for him side by side with his twin sister Molly. I won’t deny that I cried when I read of his dad John’s feeling of panic when, on a particularly awful night, he phoned the hospital desperately looking for help and was told not to bring him in, that there was nothing they could do. I don’t have children, but I can only imagine the how horrifying that feeling of helplessness must have been. John and Catherine subsequently moved into LauraLynn House with Leo and Molly, where Leo has received specialist care. The twins are now six months old. John, during his interview with the Irish Independent marvels at Leo’s resilience. “Now we have gotten to know this little boy. We can hold him and he looks up at me and he smiles”, he says. They can now tell Leo’s little sister that they did everything they could for him. I hope John and Catherine don’t mind me telling their story here. But I don’t mind saying that nothing I have ever read has affected me so much. I hope Catherine and John get some more time with their little boy, and when the time comes, I hope sincerely that they’ll get the support they need at such a terrible time. LauraLynn House is a wonderful facility. In their recently-opened new hospice building, they’ve thought of everything. It’s full of natural light. The bedrooms are decorated so as to make them feel as homely as possible. While every room houses essential medical equipment such as hoists, they are discreetly housed behind doors so as not to serve as a reminder that this is a medical environment. Large recliners beside beds enable tired parents to rest in comfort. Computer screens where staff can access medical records double as interactive screens for children to play games. There are guest rooms, with small kitchens where families can avail of privacy and retain some dignity at that most terrible of times. And in the most poignant of additions, there is a beautiful room called the Butterfly Suite, where children close to death are brought to die with their families around them. Importantly, LauraLynn House is not a sad place, nor is its sister organisation, the Children’s Sunshine Home. Though the facilities between provide care and respite for hundreds of children and parents, they are places of light and laughter. LauraLynn House receives NO direct government funding. Not a cent. Apart from some funds diverted from the state contributions towards the Children’s Sunshine home, on whose grounds LauraLynn House sits, the hospice relies solely on the goodwill of fundraisers to pay its staff, and maintain its buildings and equipment. Running costs for the Hospice amount to over €2m annually. That’s a lot of money to raise. When I read baby Leo’s story, I’d already started fundraising. I’d already raised quite a bit, having beaten my original target of €250, which I’d thought ambitious when I set it. But reading this made me more determined than ever. So I started to make a nuisance of myself, and it paid off. I’ve known from years of getting soaked outside churches while shaking buckets and selling raffle tickets at table quizzes, that we as a nation are an incredibly and unerringly generous people. I’ll always remember the old gentleman with no coat and a jumper that had seen better days who, outside a north Dublin church on a freezing cold, rainy night with a shy nod pressed a €50 note into my collection bucket. Once people are asked, they almost always respond with genuine enthusiasm for a good cause. But when times are that bit harder, and money is tight, I’d have understood if people were more reticent. I was prepared for that. But the opposite proved to be the case. In the end, I’ve managed to raise over €1,200 for LauraLynn House, and to say I’m delighted is an understatement. One of the most amazing elements of my fundraising effort was the response I got from my efforts to promote the cause using social media. Anyone who knows me will know that I’m an avid fan of twitter. I’ve been using it for about three years, and during that time (once the initial rite-of-passage novelty of celeb-following wore off), I’ve gathered over 1500 followers, and enjoyed thousands of fascinating, bite-size conversations with people from all walks of life on lots of interesting topics. (And politics.) I’ve even had the pleasure of meeting some people who I can now safely say will be friends for life. But despite my already strong conviction that the people you meet on twitter are among the best you’ll ever find, nothing could have prepared me for the response I got there to my fundraising efforts. In total, nearly half amount came from people who follow me on twitter. Astoundingly, a third came from people I’ve never even met. Some even passed my fundraising page on to friends and colleagues who in turn, also contributed. So when I togged out last Monday, I felt I owed it to those who donated to put in a bit of effort, over and above my usual laid-back ambling through the route. Work commitments meant training time was minimal, so I approached the day with some apprehension. (By minimal, I mean non-existent.) An old injury didn’t help, but along with a good (and annoyingly, infinitely fitter) friend of mine, I vowed I’d give it socks. (I even bought special socks for the occasion.) The first kilometre was a breeze. I was starting to wonder what the big deal about running was. By 2k, I was getting a wee bit sweaty. At 3k, I was starting to wheeze and feel a bit dizzy. By 5k, parts of me I didn’t know existed were starting to hurt, and I had to slow down for a bit. (By slow down, I mean stagger to the nearest water station and consider catching a bus.) Around the 7k mark I was definitely starting to hallucinate and reminiscent of the Lenten episode of Father Ted where everything appears to Ted to be a giant cigarette, I was having visions of tantalisingly cold pints of liquid. (Swithwicks.) The firemen cheering us on at Donnybrook at the 8km mark bolstered the spirits somewhat, despite being somewhat of a distraction. By 9k, every single part of me, including my eyeballs hurt (and didn’t stop hurting for four days). But I crossed the 10k mark having managed to run a good 90% of the route, and clocked a time of 1hr 18 minutes. Not exactly impressive, but bearing in mind that I absolutely detest running and avoid it at every opportunity, I was pretty damn chuffed with myself. I was so chuffed that I even contemplated running a victory lap around the Green. So, this post is a thank you. To anyone who made a donation to the cause, thank you, thank you, THANK YOU, from the bottom of my heart. I’m humbled by your generosity towards what is a wonderful cause. LauraLynn House value every cent of the money you donated. But in addition to that, the past few weeks served to remind me that despite all the negativity and cynicism that pervades the news, the papers and our everyday discourse, there is still an intrinsic goodness in us, and a desire within us to help out others less fortunate than ourselves. And it’s for that reminder that I’m even more grateful. You can read John McWade’s interview with the Irish Independent here. Great post, Anne-Marie. How unbearably sad to think what terminally ill children and their parents must go through. Thank you for giving some insight into LauraLynn House – what fantastic work they do. Congratulations to you on your 10K achievement and on the incredible total you raised.